In 1983 a father made a devastating choice to abandon his family. 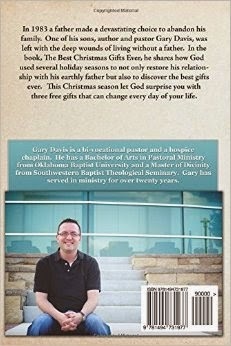 One of his sons, author and pastor Gary Davis, was left with the deep wounds of living without a father. In the book, The Best Christmas Gifts Ever, he shares how God used several holiday seasons to not only restore his relationship with his earthly father but also to discover the best gifts ever. This Christmas season let God surprise you with three free gifts that can change every day of your life. Gary Davis is a bi-vocational pastor and a hospice chaplain. He has a Bachelor of Arts in Pastoral Ministry from Oklahoma Baptist University and a Master of Divinity from Southwestern Baptist Theological Seminary. Gary has served in ministry for over twenty years. I read the book in one night and couldn't put it down, it's only 70 pages long but very powerful from start to finish. I think the reason this really spoke to me was because Gary was sharing from his heart and I actually knew him during our teenage years and never realized he was struggling. This truly is a gift from a pastor that has healed from old hurts and learned about the power of forgiveness. Your book collection won't be complete without this inspiring true story. This book is available to purchase on Amazon.com in paperback or Kindle for $4.99 click here to buy today!